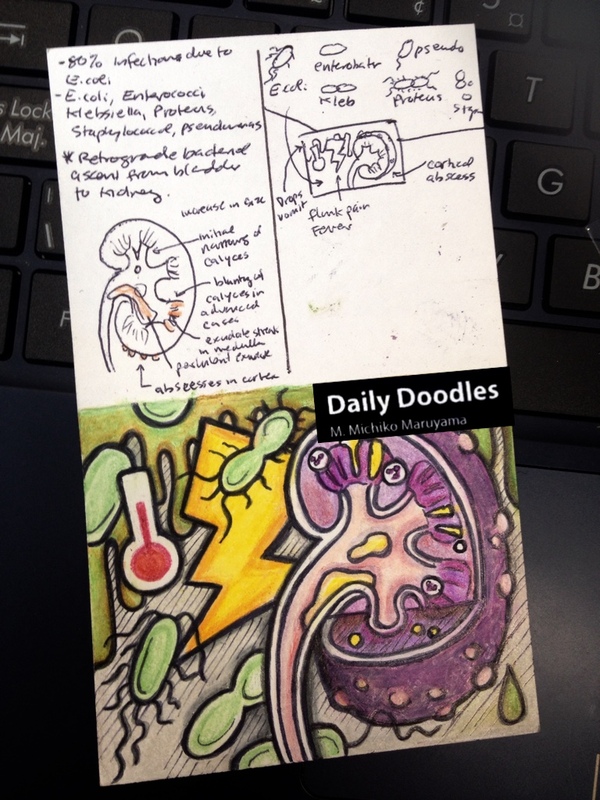 This Daily Doodle illustrates non-obstructive acute pyelonephritis, an acute inflammation of the kidney and renal pelvis, typically caused by bacterial invasion of the renal parenchyma. As depicted in this doodle, clinical presentation involves fever, flank pain (lightning bolt), nausea and vomiting (green drips). Patients may also present with lower UTI symptoms (frequency, urgency, suprapubic pain and dysuria). Bacteria can reach the kidney by ascending from the lower urinary tract or via the bloodstream. 80% of infections are secondary to E.coli. Other organisms include, enterococci, Klebsiella, Proteus, Staphylococci, Pseudomonas. Initially, there is patchy infiltration of neutrophils and bacteria in the parenchyma. Later changes include the formation of inflammatory bands extending from the renal papilla to cortex and small coritcal abscesses. Risk factors of acute pyelonephrisis includes: female, VUR, urinary tract obstruction, calculi, SCI, diabetes, congenital malformation, pregnancy, indwelling catheters, urinary tract instrumentation. T. Hooton. “Acute complicated cystitis and pyelonephritis”. Uptodate. November 2014.